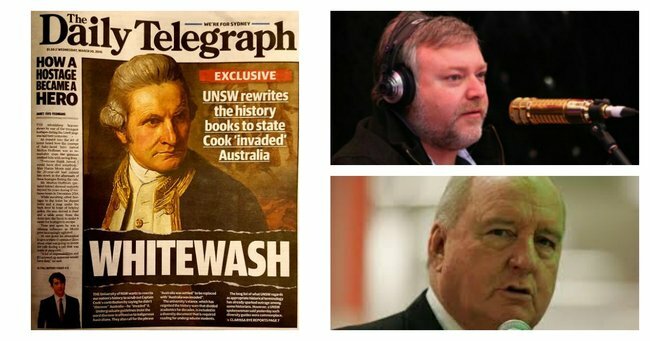 UNSW does want to rewrite our nation's history. But only because we got it wrong the first time. 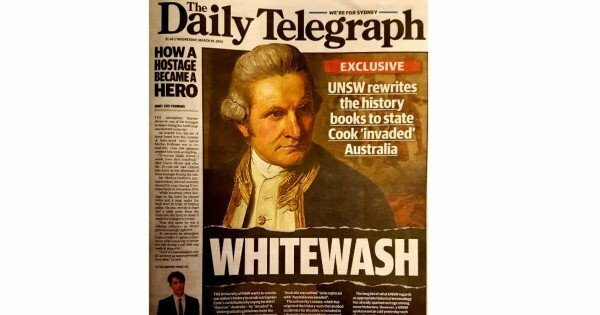 Secondly, UNSW has not rewritten any history books. They have simply stated that the prevailing language of “settled” and “discovered” is highly offensive to Indigenous Australians, not to mention historically inaccurate. Every time this subject rears it’s ugly head, I am gobsmacked that in 2016, 228 years after the Europeans arrived on Aboriginal soil, we are still having this conversation. Australian and Aboriginal history is not a piece of clay that white men (and women) can throw at each other, sculpting whatever shape best suits them. James Cook looks unimpressed. The front page of ‘The Daily Telegraph’ today. The genocide that occurred on our soil is inconceivably still a matter of opinion. The case of the British massacres perpetrated towards the Indigenous Australians are comfortably and routinely denied by journalists and politicians. Any reputable historian who has studied the case of Torres Strait Islanders considers it an unequivocal case of genocide, is dismissed as leftist whinging. We need to acknowledge the persecution of our Indigenous population, and afford them the same respect as we do victims of the Holocaust. I do find it comforting that only four people read The Daily Telegraph. But, unfortunately, the issue is bigger than that. Sandilands, articulate and sensitive as always, said, “I’m not interested in who was here first and who did what, get over it, it’s 200 years ago.” I wonder if he would have quite as much guts looking into the eyes of an Aboriginal person whose ancestors were part of the Stolen Generation, have a lower life expectancy than any ‘white fella’, and have lost their connection to the oldest culture in world history. I wonder. Given that Sandilands’ job description would literally read “offend”, one would hope that the public isn’t looking to him for a lesson on history. I am concerned, however, that this way of thinking does not begin with the Telegraph and end with Sandilands. It extends much, much further. Every time a headline like the one today runs, it does irreparable damage. 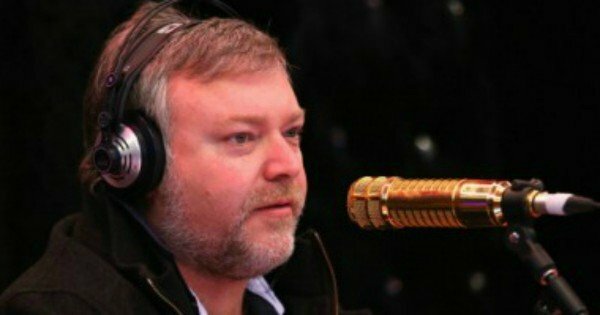 Every time Sandilands or Bolt or Jones trivialises the atrocities faced by Indigenous people, they are rubbing salt in a gaping wound. I did not ‘settle’ or ‘discover’ my neighbours house. I straight up invaded it. It is not semantics, and it certainly isn’t a left/right wing issue. It is a matter of historical fact. And who is better qualified to lecture us on Australian history than a University whose job it is to research and contribute to knowledge. If only the undergraduate guidelines rolled out by UNSW were extended to journalists.